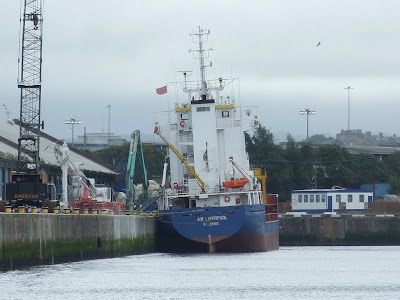 Seen completing her discharge of cement in Glasgow's King George V Dock yesterday, AB LIVERPOOL left the river early this morning bound for Jelsa in Croatia. Originally named SAAR LIVERPOOL, this coaster changed names when she was transferred from her original German flag to her current one, that of Antigua and Barbuda. She was built in 1996 in Romania by Santierul Naval Galati S.A. and is 89.77 metres long, 2,844 gross tons, and has a deadweight of 4,224 tonnes.